From left: Ludi Lin, Naomi Scott, and Dacre Montgomery — the black, pink, and red Power Rangers — prepare to shoulder the burden of playing characters who have been captivating children’s imaginations for 24 years. The Disney live-action Beauty and the Beast opens this week. It stars Emma Watson from the Harry Potter movies. You are almost certainly familiar with both the movie and its star, and you probably know whether or not you want to see them (though there is a capsule review if you’re curious). So I thought it might be nice to spend a little time with some actors you may not know, who are starring in the upcoming Power Rangers movie, which you may be less certain about attending: Dacre Montgomery, Ludi Lin, and Naomi Scott. 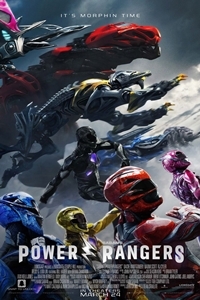 The film doesn’t open until the 24th, but that just gives you time to get curious and/or excited about a feature film adaptation of a long-running children’s television show featuring a group of young people from various backgrounds who find they are much stronger together than they are on their own. Matthew Lickona: Why do you think you got the part? LL: Mine was where Judd Nelson is making fun of the girl. But I really think it was something intellectual, where our mental processes clicked with the characters. And I don’t mean to speak for Dean Israelite, the director, but after seeing how he works behind the screens and monitors and stuff, I think he really feels these scenes. And I hope we got the part because he felt something that connected us to the character. Dacre Montgomery [who plays Jason]: She was cast first as the pink ranger. ML: So you got the part based on how well you worked with her? DM: No, I was cast as her love interest before I even met her. We didn’t do a chemistry read or anything. I didn’t even know I was cast until it was on social media. NS: I found out when it was put on Instagram. LL: I found out over Skype. ML: Speaking of the director, was there a particular piece of direction that you found helpful? DM: He really did give us space, considering it was a massive studio film. I’d be like, “Hey man, what do you think about me doing x or y or z?” And he’d say, “Look, here’s what we can get away with, here’s what’s acceptable.” He always listened to me as much as I listened to him. LL: He was open to other people’s choices. We had very long shoot days, 14 to 17 hours, and in many instances, we would make a choice, and he would also have us do a take with his choice, and we’d end up going with our original. The creativity just flowed. I had been working in China for a long time, and there, scripts change all the time. I always heard how American screenplays are intellectual property, and you can’t change a single line. But working on Power Rangers, there was lots of ad-libbing, and a lot of the humor in the film comes out of the spontaneity we had. NS: The line in the trailer where Lin sees his color and says, “I’m black!” and RJ Cyler [who is African-American] answers, “No, you’re not” — that was one that stayed in. ML: The film is an adaptation of a highly episodic TV series, and the press notes are full of talk about deepening the characters so that they go on personal journeys along with the film’s larger adventure storyline — things that make the characters resonate with people. Was there a piece of art when you were the age of these characters that resonated with you? LL: There was actually a piece that helped me with this character. Zack has a very rich Asian cultural background, especially in his ties to his family, his mom. My grandmother has passed away, but I found a piece of rope that she used as a keychain and always carried with her. It brought the feeling back of how when I was a kid, I was on my own a lot, and my grandmother was the person who raised me, and she wasn’t well. That’s kind of like Zack’s relationship with his mom. The rope brought back the feeling of how intimate those scenes are supposed to be, as opposed to the way the character is outside of the family setting. LL: I can see that. NS: Bend It Like Beckham is not as arty. DM: Sorry, it’s kind of a wanky answer.